Northwest Florida’s pristine natural world is being threaten by a group of non-native plants and animals known collectively as invasive species. Exotic invasive species originate from other continents and have adverse impacts on our native habitats and species. Many of these problem non-natives have nothing to keep them in check since there’s nothing that eats or preys on them in their “new world”. One of the most problematic and widespread invasive plants we have in our local area is air potato vine. Air potato vine originated in Asia and Africa. It was brought to Florida in the early 1900s. People moved this plant with them using it for food and traditional medicine. However, raw forms of air potato are toxic and consumption is not recommended. This quick growing vine reproduces from tubers or “potatoes”. The potato drops from the vine and grows into the soil to start new vines. 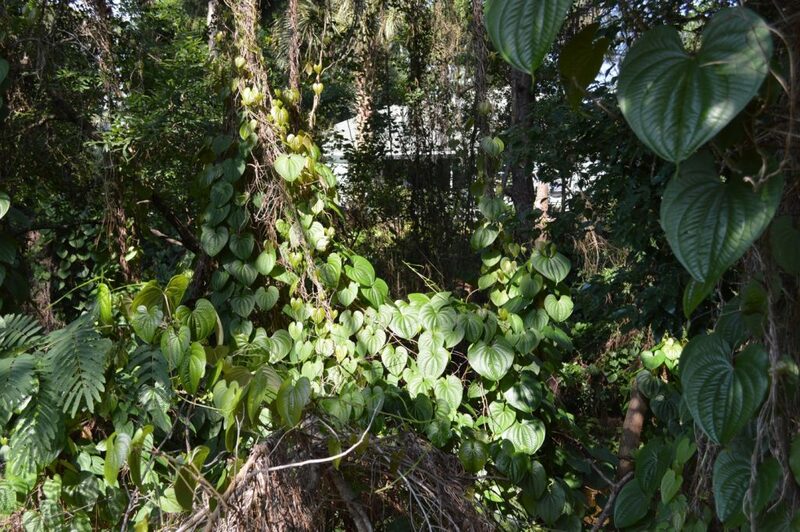 Air potato is especially a problem in disturbed areas like utility easements, which can provide easy entry into forests. Significant tree damage can occur in areas with heavy air potato infestation because vines can entirely cover large trees. Some sources report vine growth rates up to eight inches per day! Mechanical removal of vines and potatoes from the soil is one control method. Additionally, herbicides are often used to remediate areas dominated by air potato vine but this runs the risk of affecting non-target plants underneath the vine. 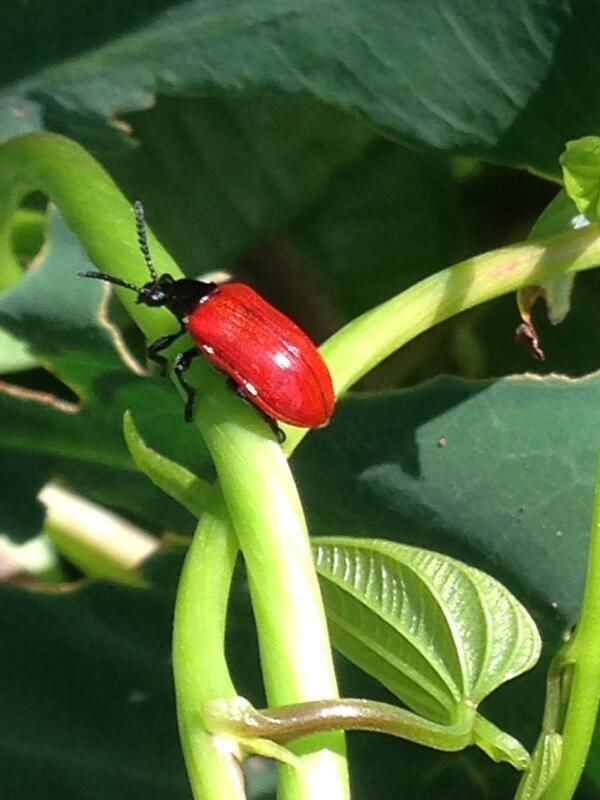 A new tool for control was introduced to Florida in 2011, the air potato leaf beetle. Air potato beetle releases have been monitored and evaluated by United States Department of Agriculture (USDA) researchers and scientists for several years. Air potato beetles target only air potato leaves making them a perfect candidate for biological control. Biological controls aid in the management of target invasive species. Complete eradication is not expected, however suppression and reduced spread of air potato vine is realistic. 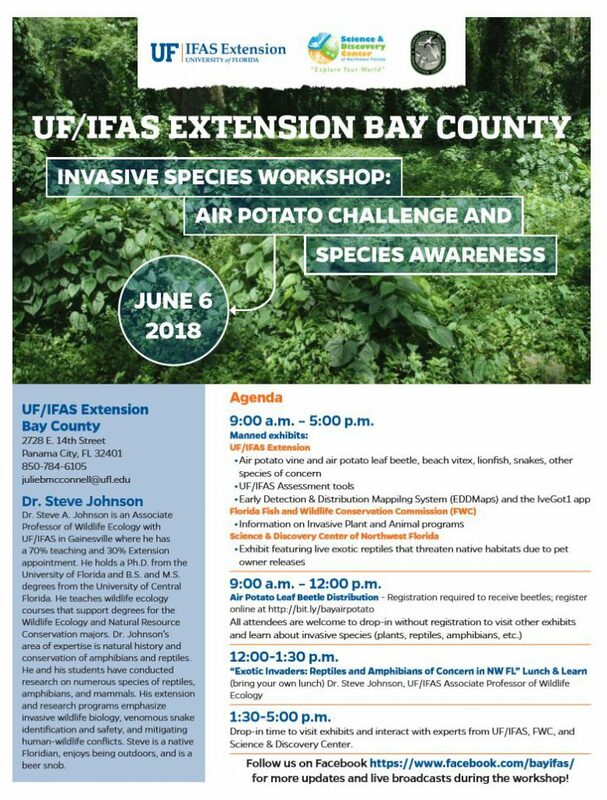 In conjunction with the Air Potato Challenge, UF/IFAS Extension Bay County will be hosting an invasive species awareness workshop. Dr. Steve Johnson, UF/IFAS Associate Professor of Wildlife Ecology, will be presenting “Exotic Invaders: Reptiles and Amphibians of Concern in Northwest Florida”. Additionally, experts from UF/IFAS Extension, Florida Fish and Wildlife, and the Science and Discovery center will have live exhibits featuring invasive reptiles, lionfish, and plants. For more information visit http://bay.ifas.ufl.edu or call the UF/IFAS Extension Bay County Office at 850-784-6105.